Apparently launched into orbit at 18:59 UTC according to a Russian watching at Palmachim. The satellite is reported to be a SAR sat similar to TecSAR. Since it has high imaging capability, how can it be defined in terms of image resolution? Since the Space-Track orbital data for all Ofeq satellites became classified in early 2011 I am assuming that we will see no data for this satellite. These are very rough... would be great if observers could actually go look for these. Should we assume there is any accuracy in the images produced for this satellite? Accurate launch time 19:06:02 UTC. Except that later in the video it seems to show another camera with 19:06:40... so I am a bit confused. In any case it looks like my TLEs above are 9 minutes off. That bright flash and apparent expulsion of unburned propellant about 11 seconds after launch was interesting. I wonder if any performance was lost because of that? The same thing can be seen in earlier Shavit launch videos, so I'm guessing it is by design. No idea why though. That bright flash and apparent expulsion ...... about 11 seconds after launch was interesting. It is the jettison of the TVC unit. After the launcher gains enough speed, it uses aerodynamics control, until stages 1/2 separation. Hmm while there are no TLEs, Space Track DOES give the orbit parameters for Ofeq 10: 332 x 609 km x 140.94 deg. (orbital period 94.01 min). Orbit from Ted Molzcan and the amateur spotting network. It seems to another amateur to be an odd orbit for a radar bird--not circular. It should be added this is still provisional & not confirmed. Why should the orbit be circular? The perigee is at middle-eastern latitudes, which is presumably when the sensors will be on. 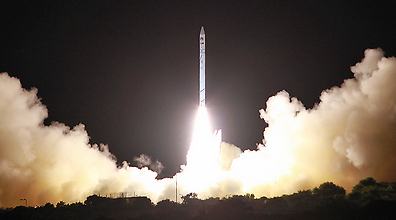 Apogee can be higher to extend the lifetime of the satellite.